"Daisy," as she was affectionately called by family and friends, was the second of six children of William Washington Gordon and Eleanor Kinzie Gordon. Family members on her father's side were early settlers in Georgia, and her mother's family played an important role in the founding of Chicago, Illinois. A sensitive and talented youngster, Daisy Gordon spent a happy childhood in her large Savannah home, which was purchased and restored by Girl Scouts of the USA in 1953. Now known as the Juliette Gordon Low Girl Scout National Center, or often referred to as the Birthplace, the handsome English Regency house was designated a registered National Historic Landmark in 1965. Young Daisy Gordon developed what was to become a lifetime interest in the arts. She wrote poems; sketched, wrote and acted in plays; and later became a skilled painter and sculptor. She had many pets throughout her life and was particularly fond of exotic birds, Georgia mockingbirds, and dogs. Daisy was also known for her great sense of humor. In her teens, Daisy attended boarding school at Virginia Female Institute (now Stuart Hall School) in Staunton, Va., and later attended Mesdemoiselles Charbonniers, a French finishing school in New York City. 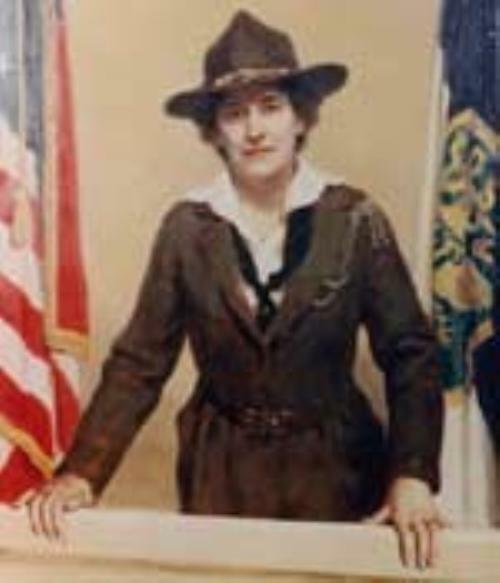 Following her school years, Juliette Gordon traveled extensively in the United States and Europe. On December 21, 1886, her parents' 29th wedding anniversary, Juliette married William Mackay Low, a wealthy Englishman, at Christ Church in Savannah, Georgia. Although the couple moved to England, Juliette continued her travels and divided her time between the British Isles and America. Before her marriage, Juliette had suffered from chronic ear infections. She had lost most of her hearing in one ear because of improper treatment. At her wedding, when she was 26, she lost hearing in her other ear after a grain of good-luck rice thrown at the event lodged in her ear, puncturing the eardrum and resulting in an infection and total loss of hearing in that ear. During the Spanish-American War, Juliette came back to America to aid in the war effort. She helped her mother organize a convalescent hospital for wounded soldiers returning from Cuba. Her father, who had been a captain in the Confederate army, was commissioned as a general in the U.S. Army and served on the Puerto Rican Peace Commission. At the end of the war, Juliette returned to England and to a disintegrating marriage. The Lows were separated at the time of her husband's death in 1905. Juliette Gordon Low spent several years searching for something useful to do with her life. Her search ended in 1911, when she met Sir Robert Baden-Powell, founder of the Boy Scouts and Girl Guides, and became interested in the new youth movement. Afterwards, she channeled all her considerable energies into the fledgling movement. Less than a year later, she returned to the United States and made her historic telephone call to a friend (a distant cousin), saying, "I've got something for the girls of Savannah, and all of America, and all the world, and we're going to start it tonight!" On March 12, 1912, Juliette Low gathered 18 girls to register the first troop of American Girl Guides. Margaret "Daisy Doots" Gordon, her niece and namesake, was the first registered member. The name of the organization was changed to Girl Scouts the following year. In developing the Girl Scout movement in the United States, Juliette brought girls of all backgrounds into the out-of-doors, giving them the opportunity to develop self-reliance and resourcefulness. She encouraged girls to prepare not only for traditional homemaking, but also for possible future roles as professional women—in the arts, sciences and business—and for active citizenship outside the home. Girl Scouting welcomed girls with disabilities at a time when they were excluded from many other activities. This idea seemed quite natural to Juliette, who never let deafness, back problems or cancer keep her from full participation in life. From the original 18 girls, Girl Scouting has grown to 3.7 million members. Girl Scouts is the largest educational organization for girls in the world and has influenced the more than 50 million girls, women and men who have belonged to it. Juliette Gordon Low accumulated admirers and friends of all ages, nationalities and walks of life. 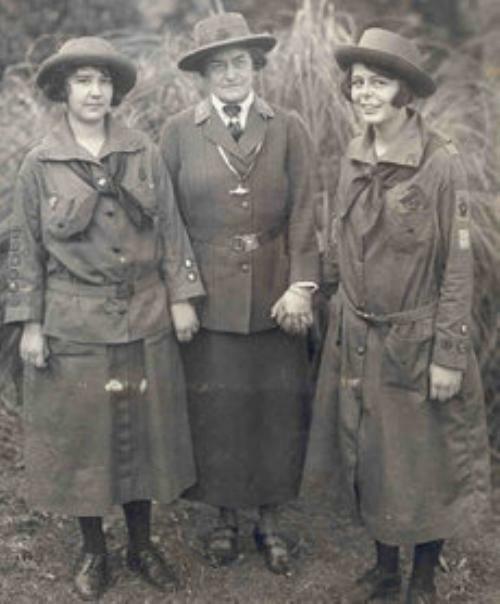 By maintaining contact with overseas Girl Guides and Girl Scouts during World War I, she helped lay the foundation for the World Association of Girl Guides and Girl Scouts. After her death from breast cancer in 1927, her friends honored her by establishing the Juliette Low World Friendship Fund, which finances international projects for Girl Scouts and Girl Guides around the world. Juliette Gordon Low died at her Savannah, Georgia, home on Lafayette Square January 17, 1927. She is buried at Laurel Grove Cemetery in Savannah.